Monday - Friday until 5pm by appointment only. 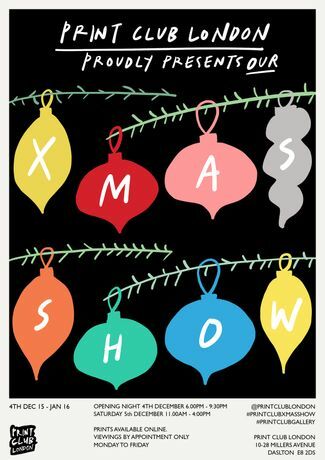 With Jack Frost nipping at more than our noses this week, it’s clear that the new season is upon us and with that we are excited to invite you to our Print Club Xmas Show AND Absorb Arts Open Studios. With over 15 artists featured in this months gallery show, we are certain there is something for everyone. All artwork will be available to purchase off the wall and all framed artwork will be on sale with an exclusive buyers discount throughout the duration of the show. No Christmas event would be complete without the classic festive treat, Mulled Wine!! We will be keeping you warm, cosy and filled with hot, steamy, boozy treats while you browse the night away, shopping our collection of limited edition, framed and unframed screen prints from some of our finest artists. As well as browsing the gallery you can pop upstairs and take a tour through our fine artists studio space, Absorb Arts. Meet the artists who will be more than happy to show you around their studio whilst their work is on display as well as for sale! Painting, Photography, Illustration, Design, Sculpture, Textiles, Print Making and Drawing.